Carlo Alban was always a performer at heart. And as a young teen, he got a break as a regular cast member on Sesame Street. And even though it seemed that he was living a dream, he had a secret: he was undocumented. Carlo Alban, now 32, has a one-man show, “Intringulis,” which translates to a snag or difficulty. “Intringulis,” is Carlo’s own coming out story, in which he tackles the struggles of being undocumented, childhood success, and drug use as a teen. 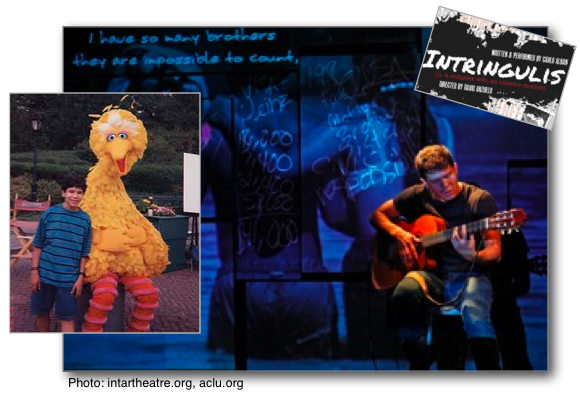 Here, Carlo performs an excerpt of the play, live before an intimate audience at Intar Theatre in New York City.